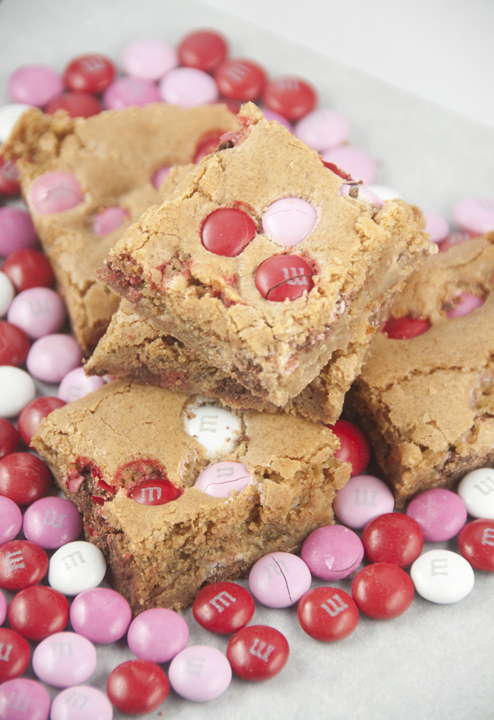 Brown Sugar M&M Blondies are an easy dessert to make for Valentine’s day or any occasion. 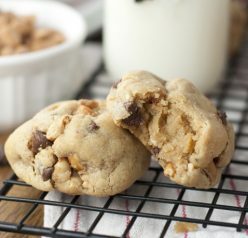 They are, soft, chewy and full of flavor! I know I’m a month early, but I think I covered all of my Valentine bases this week: I provided you with a Valentine’s day dinner idea, a dessert recipe for the chocolate addicts, and now one sweet treat for those who aren’t huge on chocolate. Anyone else besides me? I have always been a “vanilla” kind of girl, but I do like the occasional chocolate indulgence. Blondies are the perfect dessert to me. They are like brownies in shape and texture, but are flavored with brown sugar in place of the chocolate. 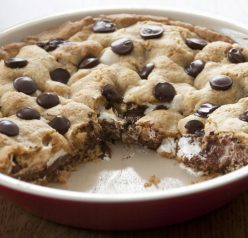 These Brown Sugar M&M Blondies are so delicious! These brown sugar M&M blondies are bursting with the wonderful flavor of brown sugar, creating a caramel-like flavor that is just amazing. That makes them pretty fabulous in my book. I also love the festive colors of the M&M candies. You can change up the colors of the M&M’s for whatever occasion you happen to be making these for! I’m also loving these Strawberry Cream Cheese Brownies from my friend Kirsten. Stay warm this weekend if you live anywhere in the vicinity of this arctic tundra we are experiencing this coming weekend. We are in for another snow storm this weekend and they are saying 10-18 inches of snow expected where I live up by the lake. It’s a good thing we’ve had a couple days of weather in the 50’s to make room for the new snow! Some sunshine would be great, mother nature. OK, I’m done venting. Happy (way) early Valentine’s day everyone! Mix together flour, baking powder, baking soda, and salt and set aside. Melt butter in a separate bowl. Add firmly packed brown sugar in with the butter and mix well. Cool slightly. Add beaten eggs and vanilla to the butter/sugar and blend well. Add flour mixture, a little at a time, mixing well. Mix in 1 cup M&M's. Spread in a generously greased 9 x 13 inch pan. Pat down with hand or spatula so they are evenly spread all around the pan. Sprinkle the rest of the M&M's on top and push down slightly into batter. Bake for 25 minutes or until toothpick inserted in center comes out clean. Store in airtight container at room temperature. Original publish date: 2/23/15. Edited/updated and repulished on 1/12/18. .My mom used to make them. But, she would use chocolate chip cookie recipe. I always wondered why blondies taste so much like caramel! Now I know it’s the brown sugar. Oh, I’m afraid to make these, because then there’s an entire pan of them staring at me. I think I’ll do it anyway. I think they freeze reasonably well. Thanks, and Happy Valentine’s Day, and most of all…stay warm!!! I think Mr. Wishes can help with that! Aww happy Valentine’s day to you too! You can cut the recipe in half and bake in a 8×8 pan too! Like how I spun that there? Seriously, these sound insanely good! Am I missing the balance of sugar and butter? Guess it’s me. I read 1/3 cup melted butter and 1 cup Brown sugar but my ingredients say 2/3 cup butter and 2 cups Brown sugar. I didn’t know where to add the difference. Am I reading this incorrectly? 2/3 cup butter and 2 cups brown sugar is correct! If you look in instructions, it reads differently. Sorry, guess I should have known. Strange. I looked several times and it is listed correctly on my site. Sorry! I have no idea what’s going on. Oh my! O? That’s nuts! I’ll think warm thoughts for you. Although I’m a little jealous because we hardly ever get to see snow! These blondies look amazing too! I love using brown sugar in my cookies. It makes them so soft and delicious…yum! 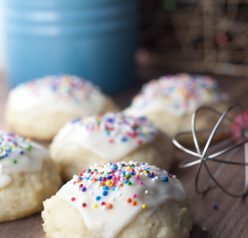 I’m ready for this winter to be done too…but a batch of these delicious goodies will warm things up! 🙂 These are perfect for Valentine’s Day! Oh man, it’s freezing here, too. It’s been white out conditions for most of the day, too…perfect for cuddling inside with a batch of these scrumptious blondies, though! Simply damn delicious sweetbites blondies!!! I mean I do love chocolate but I actually might like brown sugar a little better! Shh don’t tell anyone! Can’t wait to try these! I can’t get over how much snow you all are getting!! It’s insane. These bars sound so so good! What a sweet Valentine’s Day treat! I love your photo with the treats in a heart shape! So sorry I missed these before Valentine’s Day, Ashley! They are just perfect for the caramel lover, like me. 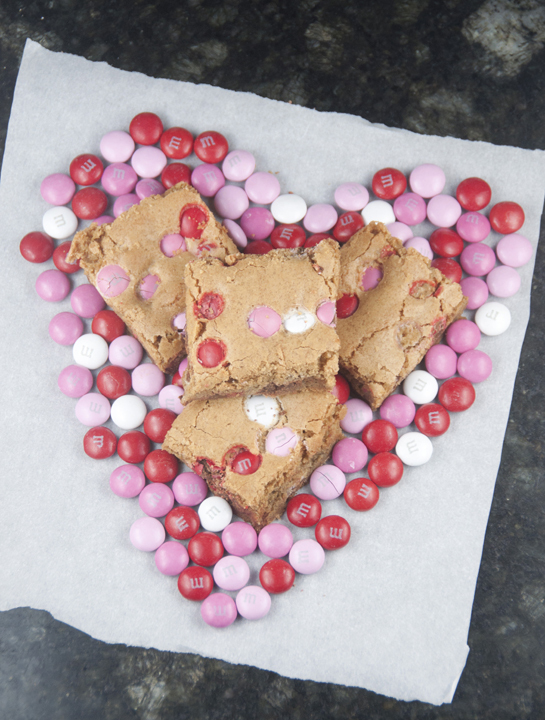 I adore Blondies of all kinds. There’s nothing like that chewy, buttery, brown sugary goodness! Our high is expected to be just 7 degrees tomorrow here in Indy. So, we’re not that much warmer down here. Keep warm, my friend! I love that picture with the m&m heart. So cute! Blondies are definitely one of my favorite desserts. Oh, and this weather is terrible. I just want spring to come. Am wanting to make these Brown Sugar Blondies next month. It just seems like a lot of brown sugar. I would like to cut it to 1 and a half cups. Would that be possible without ruining the results? You can feel free to try it that way! I can’t say for sure how the taste would be. Sorry! Adorable and delicious! I need to start my Valentine baking asap! These are way too cute! Besides, if I’m having a blondie, I want a load of chocolate included. Thanks for sharing my strawberry cream cheese brownies. I’d love to have one of each right about now!